A few months ago I had a wonderful appetizer at Ron Gastro Bar in Amsterdam: a salad of chicken gizzards confit, celeriac, celery, and cream of foie gras. It also had crispy chicken skin and freshly shaved truffle, but what really stood out was the chicken gizzards and the combination with the celeriac and cream of foie gras. 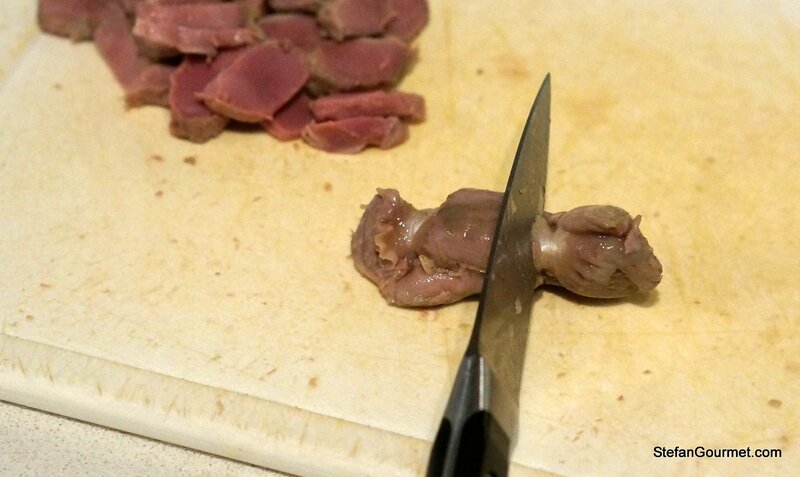 I don’t think I would have recognized them as chicken gizzards because they had been trimmed of all the connective tissue and were all pink tender meat. They were advertised as “confit”, but I had a hunch they had been cooked sous-vide. It was a fun combination of a low brow ingredient (chicken gizzards) with a high brow ingredient (foie gras). I decided it would be nice to do my own version of this one Michelin star dish. It turned out great! I simplified matters and tried to make this with as few ingredients and as simply as possible. 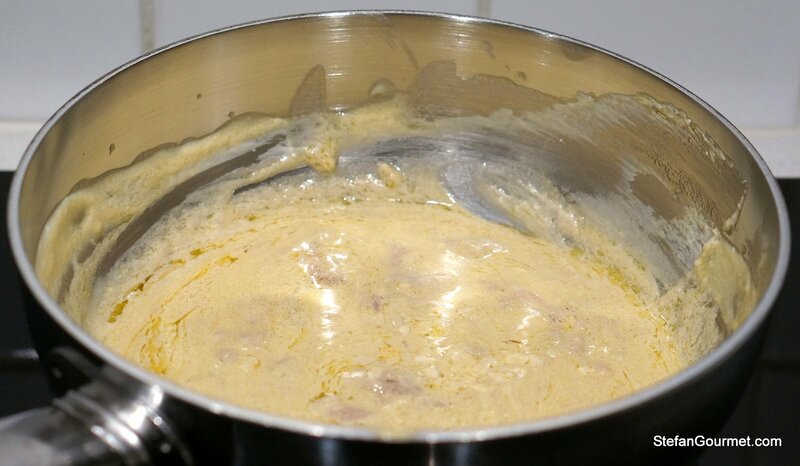 I had never made cream of foie gras before, but it turned out to be very easy and very delicious to make. I had never cooked chicken gizzards sous-vide before and found a cooking time and temperature in Modernist Cuisine, which is 12 hours at 60ºC/140ºF. I tried this and it was bad: the chicken gizzards ended up ‘crispy’. I know this is a strange thing to say about meat, but it’s the best word as I can think of. It was a bit like biting into a raw carrot. Edible, but not what I was after. So I used my own best guess based on this result and tried 24 hours at 64.5ºC/148ºF instead. The result was great: tender, juicy, and just like I remembered from Ron Gastrobar. 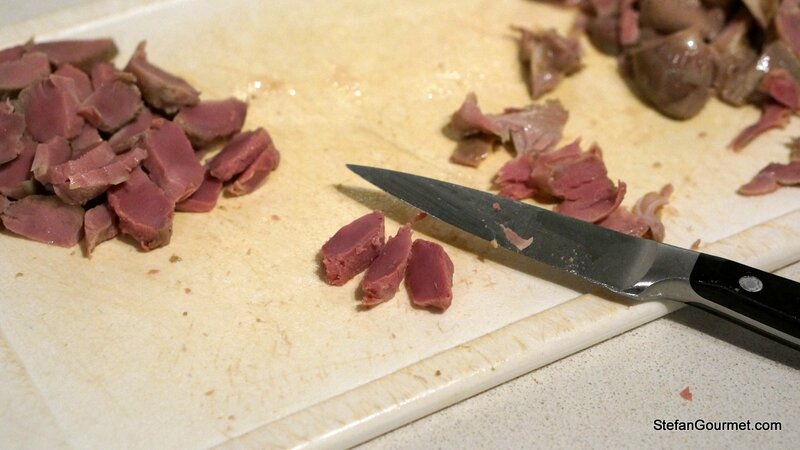 It takes a bit of work to trim all the connective tissue from the chicken gizzards, but other than that this requires little effort for such an original, tasty and decadent dish. And it only requires seven ingredients! 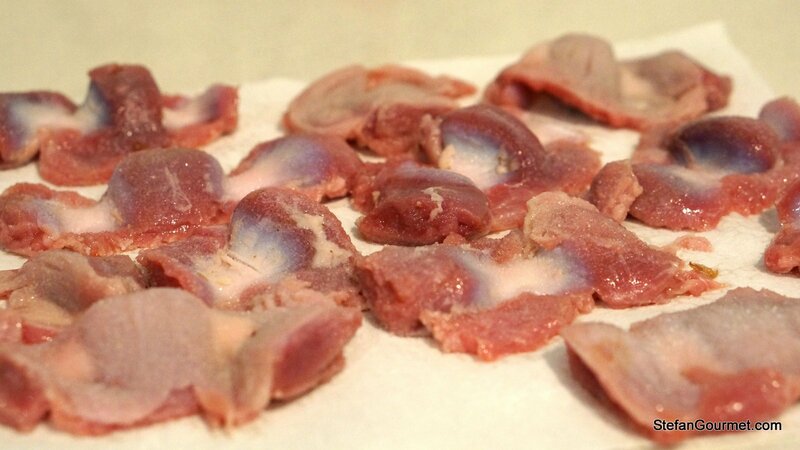 Rinse the chicken gizzards under cold running water. Pat them dry with paper towels. Trim any discolored or other parts that look like they should be trimmed. Season with salt. Vacuum seal the chicken gizzards with the butter or olive oil. Cook sous-vide for 24 hours at 64.5ºC/148ºF. 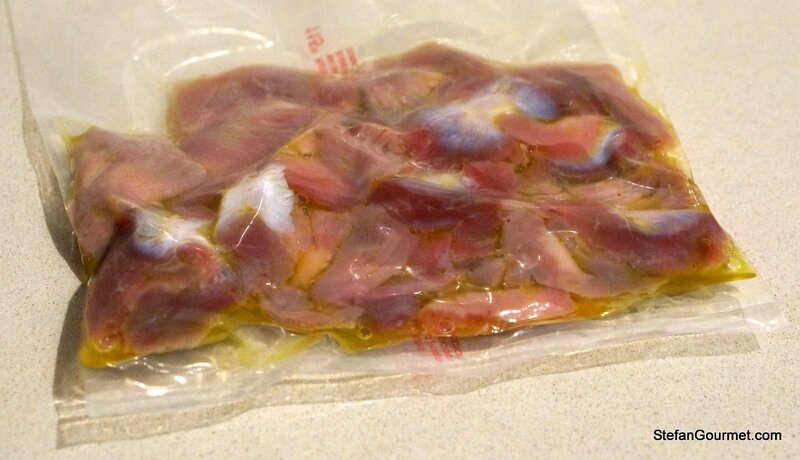 Take the chicken gizzards out of the sous-vide pouch and discard any fluids. 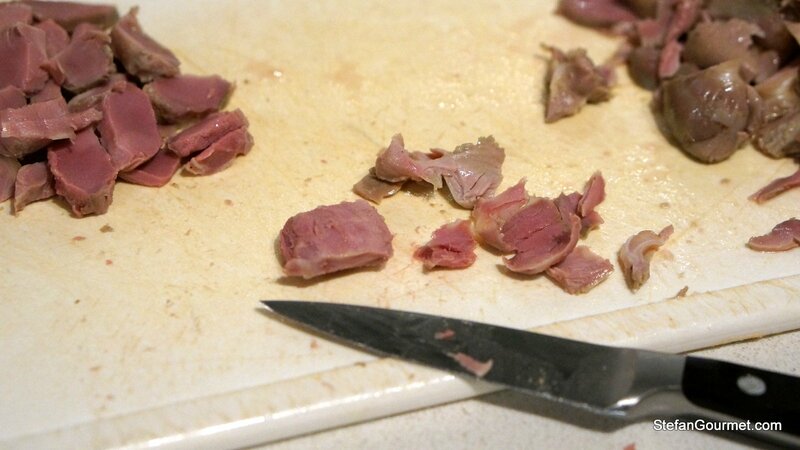 Now trim away everything from the chicken gizzards that does not look red/pink. You could choose to eat everything as even the connective tissue has become tender thanks to the low and slow cooking, but it does not look as nice. Slice up the good meat and discard the trimmings (you could use them to make chicken stock). 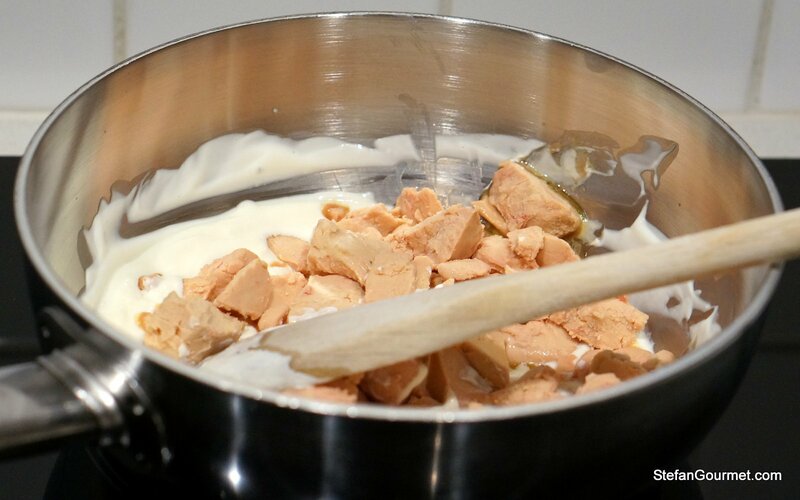 To make the cream of foie gras, gently heat the cream in a saucepan and add the raw foie gras (roughly chopped, veins removed). Stir over low heat until the foie gras has melted. Do not allow to boil! Use an immersion blender to make it completely smooth. Add salt to taste. Resist the urge to eat all of it at this point. 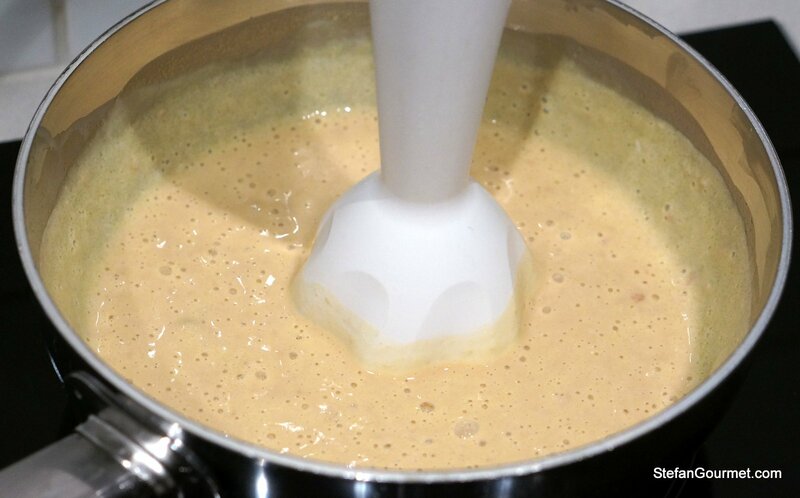 Yes, it is this easy to make cream of foie gras and it is this delicious. I like it even better when it has cooled off, so allow the cream of foie gras to cool and firm up in the refrigerator. 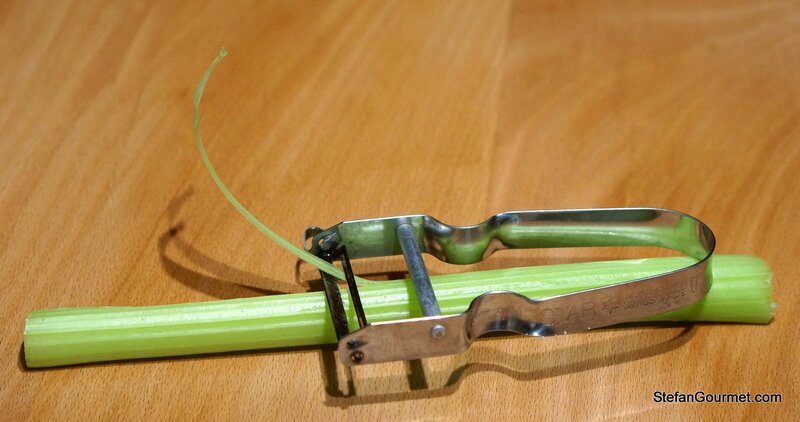 Wash and dry the celery stalks, and remove the tough strings with a vegetable peeler. Cut into pieces of about 10 cm (4″). 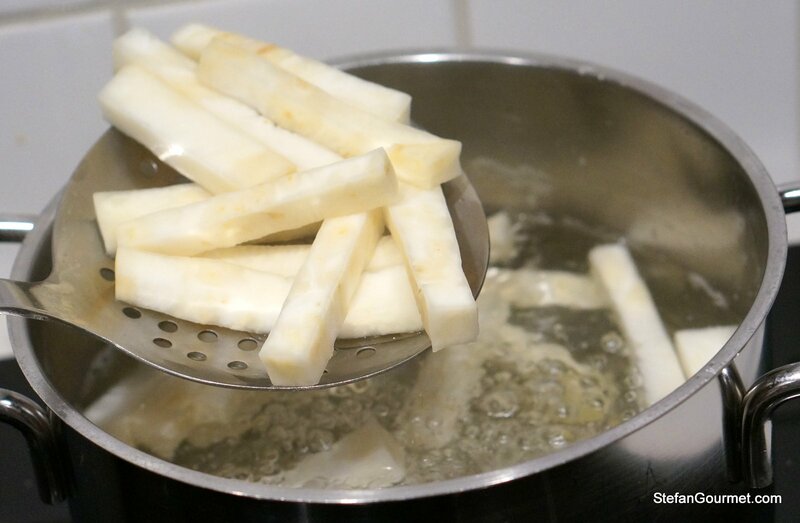 Cut the celeriac into sticks of about 10 cm (4″) long and 1 cm (1/2″) wide. Parboil them for 30 seconds in boiling salted water and then plunge them in cold water to stop the cooking. Spread out a layer of the cream of foie gras on each plate. 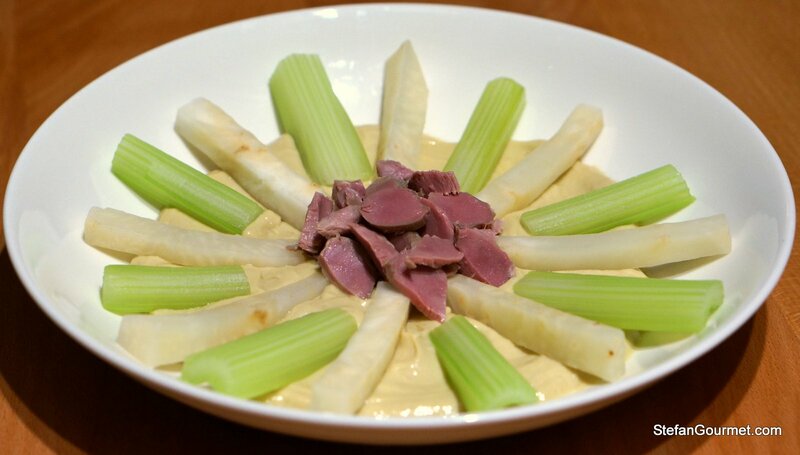 Arrange the celery, celeriac, and gizzards on top. It looks nice like this, but to eat mix everything together. 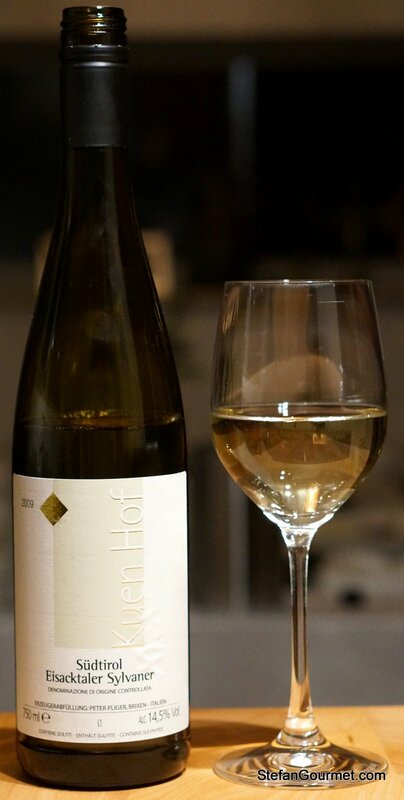 The cream of foie gras requires an aromatic white wine. 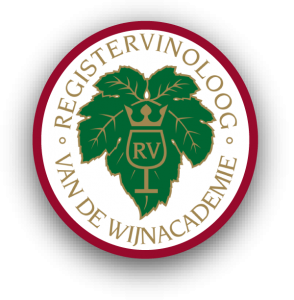 We enjoyed this with a sylvaner from Alto Adige. I love salmon teriyaki and I love salmon cooked sous-vide to 43ºC/109ºF, it is amazingly buttery. 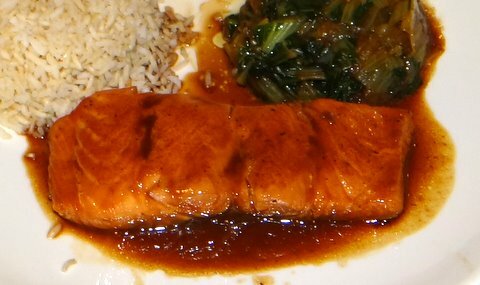 If you like salmon teriyaki and have a digital thermometer but don’t have a sous-vide cooker, do yourself a favor and prepare the recipe for salmon teriyaki sous-vide I shared two years ago using stove-top sous-vide. 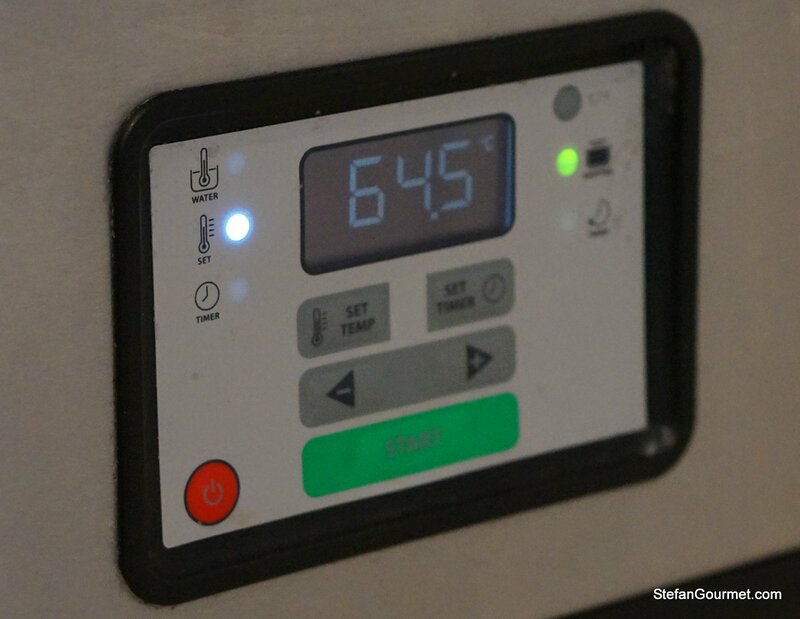 It only requires you to monitor the temperature of the pot for half an hour to keep it close to 43ºC/109ºF. Tried out this recipe, encouraged after reading that Stefan had seen good luck with adapting the Modernist Quisine recipe from 12 hours @ 140° to 24 hours at 148°, but after trimming my gizzards very carefully to remove all connective tissue and cooking them sous vide at 148° for a whole 24 hours, they turned out with a disappointing texture–springy and rubbery, just as I imagine Stefan’s described experience with the Modernist Quisine recipe’s “cripsy” outcome. I’m disheartened. 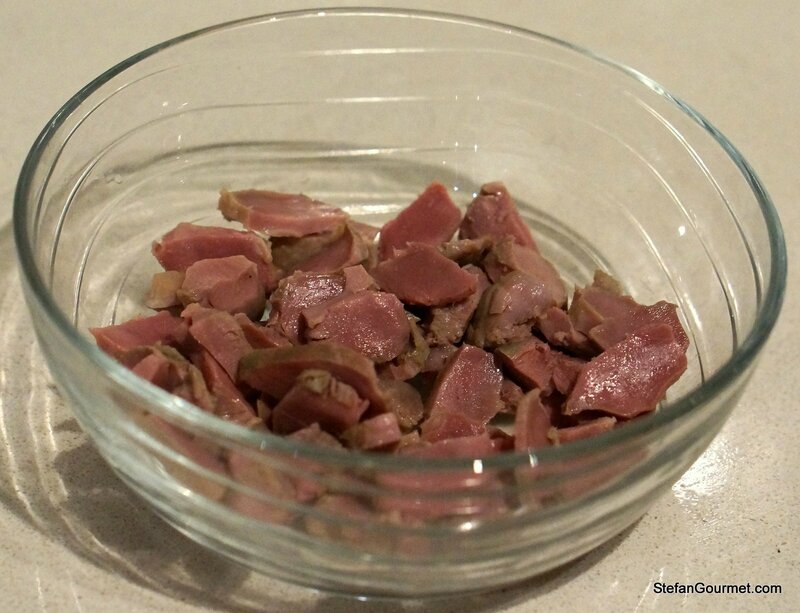 I have had some absolutely amazing chicken and duck gizzards in high-end restaurants, and I would love to be able to reproduce the results at home with an organ meat that costs less than $1.75 a pound. But for me, this recipe seems to miss the mark. Has anyone else had similar springy/rubbery results with this time and temp? Stefan, What a lovely story and description of the meal. I am so glad your hunch (about sous vide technique) was correct, because this looks amazing. Well prepared chicken gizzards on a salad, like this (or puréed, as a chopped liver/Jewish pâté 😉 are two of my favorite things. My love for liver rivals my love for salmon – particularly gorgeous Teriyaki salmon. Thanks for sharing that link, as well. 🙂 You are a motivated, passionate chef. Another fantastic recipe Stefan. I suspect that the foie gras cream would run straight into my arteries. Worth it all the same! This looks fantastic and I am certain it was delicious! Pairing of the ingredients and flavors were amazing! I don’t believe I have seen chicken gizzards offer in restaurants in US (aside from fried chicken joints). My mother makes Chinese cold salted gizzard appetizers that were addictive. Thanks for showing me another way to make one of my favorite food! This is one beautiful appetizer, Stefan. When I wrote our risotto recipe, I struggled with how to describe the trimming process. Basically, I side-stepped the issue. I should have used the “color” method you employed. Nicely done! I love chicken gizzards. I have to try this recipe.